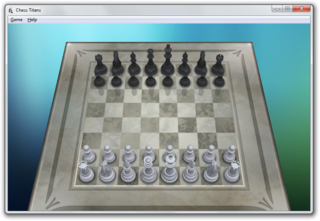 Add sub-page for "Media Center Chess Titans", a full-screen version of the game embedded into the game's executable which although is technically used as it can be launched from Windows Media Center, it is not documented in any Help menus, and it also contains a whole bunch of unused content the normal game doesn't. One of the new games included with Windows Vista and 7. See if the Full Speed Render does anything. As with most other games shipped with Vista and 7, it has an internal g_debugEnabled variable. Rotate Board - Rotates the board to the other side in the 3D view, but doesn't do anything in the 2D view. Self Play - View a game played by two computer players. If a game already began, the game will then start a new one. Toggle Top Down View - Goes to the top-down 2D view, but going back to the 3D view will cause the graphic setting to drop to the lowest-quality 3D setting. An interesting feature that isn't documented anywhere (Help Menu-wise) is XInput (gamepad) support – if the game detects an Xbox 360 controller plugged into a USB port, the P1 corner on the controller will light up, signifying the controller can be used. Possibly undocumented because Microsoft thought people were too used to the traditional controls, and a gamepad would be odd to use. It's a neat little feature, nonetheless. B/Back Undoes the previous move. A/X Selects the square the cursor is on. Moving the cursor onto a piece and pressing A/X selects it. Pressing A/X on one of the highlighted squares moves the piece there. In Chess.dll, there are several portions of the shader code starting at 12B9358. This page was last modified on 19 April 2019, at 13:17.